Ocean Park is a neighborhood on Martha's Vineyard that has hosted rich and influential African-Americans for over a hundred years. The "emperor" is a judge once nominated for the US Supreme, disgraced by his associations with a CIA thug, drug kingpins, and Mafia dons. Talcott Garland is the professor son left to administer his father's estate and unravel the puzzle of his suspicious death. If you're waiting for the next John Grisham thriller, check this out. Extremely well written and plotted. In his triumphant fictional debut, Stephen Carter combines a large-scale, riveting novel of suspense with the saga of a unique family. The Emperor of Ocean Park is set in two privileged worlds: the upper crust African American society of the Eastern seabord—families who summer at Martha’s Vineyard—and the inner circle of an Ivy League law school. Talcott Garland is a successful law professor, devoted father, and husband of a beautiful and ambitious woman, whose future desires may threaten the family he holds so dear. When Talcott’s father, Judge Oliver Garland, a disgraced former Supreme Court nominee, is found dead under suspicioius circumstances, Talcott wonders if he may have been murdered. Guided by the elements of a mysterious puzzle that his father left, Talcott must risk his marriage, his career and even his life in his quest for justice. 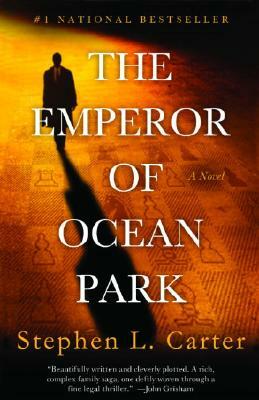 Superbly written and filled with memorable characters, The Emperor of Ocean Park is both a stunning literary achievement and a grand literary entertainment.